What is the Galileo comprehensive assessment system? What makes a benchmark series comprehensive? How do teachers and administrators use the data generated from Galileo? What tools does Galileo offer to incorporate student performance data into measures of instructional and/or educator effectiveness. View the webinar and share it with a colleague. Access more information regarding comprehensive assessment system. Request a guided demonstration from our friendly Field Services Coordinators. 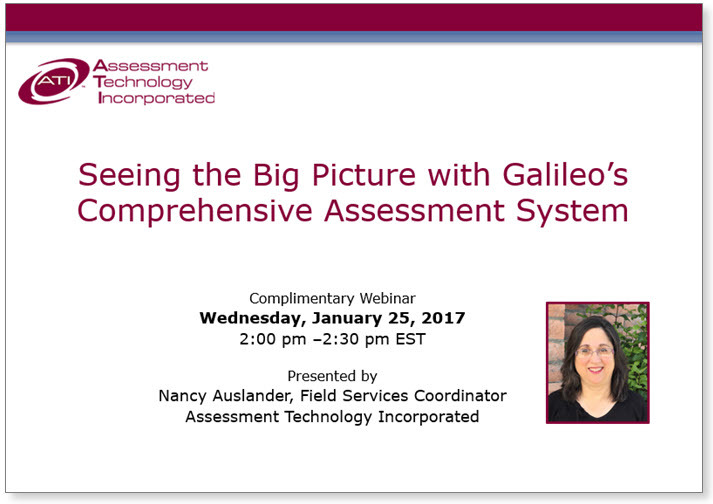 ATI webinars offer exciting insight into Galileo technology. They are complimentary and are recorded for later viewing. The recordings can be accessed from the ATI website along with many other helpful videos, Dialogs, and webisodes.